Let's be simple and say it was totally awesome! Fishing was nothing short of good for the four days that I was out there. 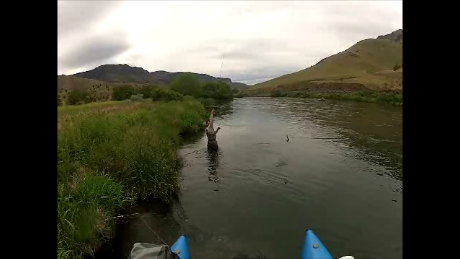 Dry fly action was really good, and the fish were totally keyed into adult golden stone fly patterns. I did catch two fish on a salmonfly pattern (Morrish's Still Stone), but the Clark's Stone was the ticket by far. I did catch fish on Chubby Chernobyl Norms, but they did not receive the action that they saw last year. The water last year was 7000CFS approximately, compared to the approximate 5000CFS reading this year when I was out there for the big bug hatch. High water seemed to make those big foam bugs work a little better last year and the year before, but this year seemed to favor more traditional patterns like the Clark's Stone and the Norm Woods Special. The Clark's Stone literally was getting destroyed; while the bigger foam patterns got lots of refusals and quick looks. I would imagine if I used those big foam bugs in the choppy buckets, they would have gotten pounded. Instead I just kept the Clark's Stone on, and got fish after fish to attack it. There were definitely times when the fishing was slower and tougher, but that is the reality of fishing for trout and the reality of any famous fly hatch. The slower times seemed to be either due to fishing spots that were the wrong ones for the stonefly hatch (caddis and mayfly spots), and speculating they would be good. A lot of these are spots that fish well at times, but not when we fished them on this trip. Also, there is definitely the variable of getting into a spot that someone just fished 15 minutes before and you have no idea of that; since the other anglers may be just around the next bend of the river. I witnessed a spot where we caught several fish right away, and then bailed only to see the next boat pull into it. They did not realize we just hammered nice bows from it; while they may have had the impression the fishing was slow at that moment. Cover the water and if nothing happens rather quickly, then move on. You are not going to beat them into biting. The hatch is in "full throttle" mode currently, and there are heavy amounts of bugs all the way from Maupin to the top of the lower river. Fishing is hot throughout the wild and scenic section, and you should get out there to experience the big bug hatch if you have not yet. Nothing is better than seeing your huge dry fly get pounded by a hungry rainbow trout. This is the time when the fish are really keyed into the surface patterns, and the trick is to fish the right water. Focus close to the banks near over hanging trees and where the tall grass has good depth and current speeds. Stay away from the traditional spots you fish caddis and mayflies at, and focus on the banks. If you see the currents falling toward the bank you are fishing, and the water is over 2 feet deep with overhanging trees; you can assume there is a rainbow trout waiting to ambush the next vulnerable golden stone landing on the water. If you fish a spot and do not get a take in a few casts, then you are probably fishing somewhere that has been fished already or it is not holding fish that are ready to pounce your offering. Many of the standard caddis/mayfly spots will produce fish, but you also should adjust your tactics to where the fish are going to be looking for stoneflies. I would say that this year seems to be a very good stonefly year on the Deschutes, and it should be really good for a couple more weeks easily (although right now it is really GOOD!). Get out there and experience the big bugs! Don't worry about the people and what everyone wants to speculate about the hatch fading out or the fishing being slow or too crowded. The hatch is not over by any means, and fishing has been red hot! It is time for you to get out and fish the stonefly hatch! If you are lacking hot patterns; stop by the Portland Orvis shop where we have some of the hottest pattens to fish with on the Deschutes. Portland Orvis does not carry the Clark's Stone, but I tie my own; so that is how I get them. Otherwise you can get all of the patterns you will need for the hatch over there. I caught a lot of fish on the Norm Woods Special and they stock that fly, along with the Chubbies and many of the popular greats. Nice work Brian,this year was definately excellent dry fly fishing,we hammered them as well on our trip.